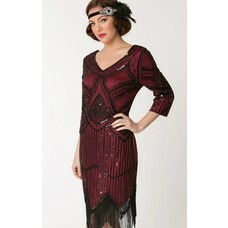 1920's deep red & black Noemie Flapper Dress with 3/4 sleeves, is beaded & sequined and a flourish of fringe at the hem. Black mesh with beads and sequins is lined with a gorgeous red polyester knit with some stretch. Side zipper, wide V-neckline, three-quarter sleeves that are lined, zig-zag scalloped hemline with luxurious black fringe. 100% Polyester except for trims.